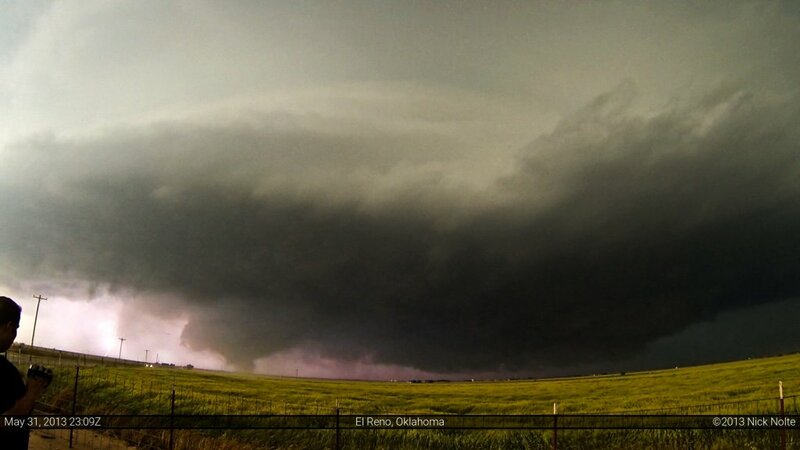 Editor’s note: At the time of publishing this tornado was rated EF-5 based on mobile doppler radar wind velocity data, but was later downgraded to EF-3 due to the lack of damage indicators higher than EF-3. I awake from my slumber at the Days Inn in Ardmore and meet up with Skip Talbot, Jennifer Brindley and David Mayhew at the Denny’s across the highway for breakfast. After finishing our early morning provisions, we go over the forecast models and we were rather confident the place to be was going to be near the triple point setting up west of Oklahoma City. As we pay our breakfast bills, both Jennifer and I receive one of those survey certificates for a free meal. We exchange high fives at our good fortune and muse at the odds of that happening. Is this a sign of things to come? Without stopping for lottery tickets, we venture back across the highway to the hotel to pack up our gear and begin the trek north on I-35. Right around noon we pass through Moore, where just 11 days earlier an EF-5 tornado had ripped through town. Traffic slows to a crawl as the destruction garners most drivers’ attention. I looked left and the Warren Theater catches my eye. 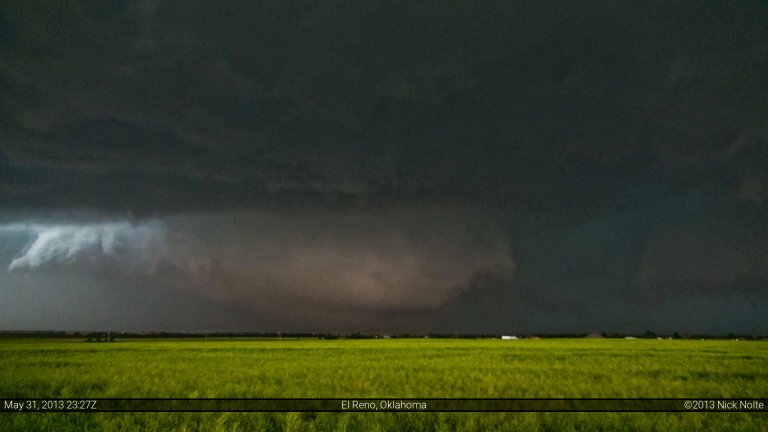 It was a prominent landmark in the tornado warning broadcasts on May 20th. It is a solemn experience driving through the area, similar to what I felt after the Mapleton tornado in 2011. We continue north and shortly before 1pm stop at the Subway on the south side of El Reno. We grab lunch and decide to head out to the “Hook and Slice Grill” that Jenn had noted on the map. A “hook” and “slice” are two things you prefer not to happen in a game of golf. 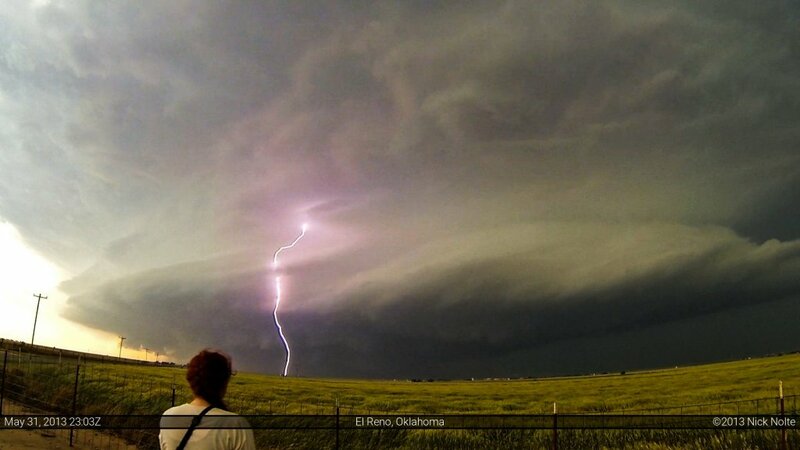 A “hook slice” is a positioning maneuver in storm chasing, which is why it caught our attention. So, we drove along the west side of town to the Crimson Creek Golf Club, which is home to the Hook and Slice grill. Despite the disappointment that it was a play on words for golf and not storm chasing, we still get a picture, but decide against sitting in the parking lot full of golfers. Instead, we pull into Adams Park just behind us. Perched on the shores of beautiful Lake El Reno, here we will sit for the next three hours. 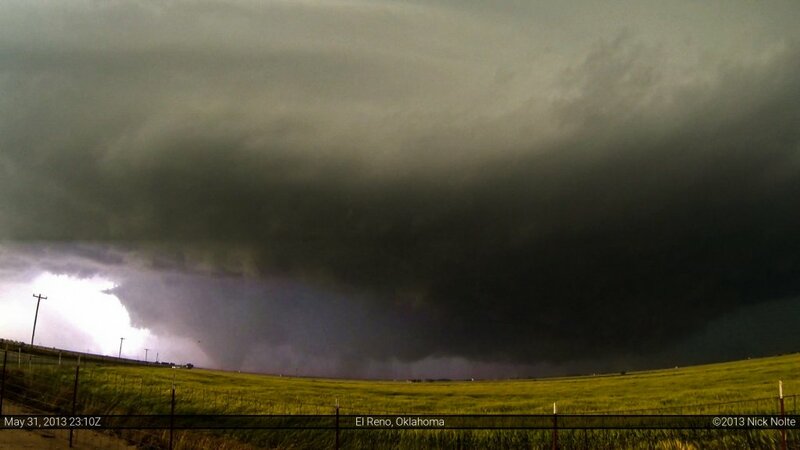 It turns out that many chasers used El Reno as a staging area that day and several of them found their way to the very same park. Guy Rhinehart is the first to discover us as he pulls up solo in his red truck. We greet each other and chat about the day as other storm chasers arrive soon after, including Tony Laubach, Marko Korošec, Brad Hannon, John Allen and others. We are also greeted by a local duck who intrudes on the proceedings, much to our delight. As the afternoon wears on, I note some cloud features that indicate the capping inversion is still holding on and that we still have a couple more hours of the beating hot sun. We watch cumulus bubbling in the distance to the west and updrafts trying to poke through that inversion, but their attempts are futile and they are choked off. It’s 2:40pm, and the Storm Prediction Center issues a mesoscale discussion indicating they are going to issue a PDS Tornado Watch within the next hour or so. The wording in the discussion includes the threat of significant tornadoes, especially as the day wears on and the low level jet ramps up. Fifty minutes later they proceed to issue the Tornado Watch continuing the wording of damaging tornadoes. As the day progresses, the cap continues to keep things held back, and the atmosphere continues to become more and more unstable. It is very hot. The sun is shining bright, and the air is very thick. As 4pm approaches, a nearby weather station reports a temperature of 86° and a dewpoint of 75.2° Very juicy air, indeed. I keep looking at the forecast mesoanalysis values on the SPC website and the parameters it is showing for our area are absolutely ridiculous. It is forecasting maxed out values for significant tornado, supercell composite and EHI parameters as well as extremely high values for CAPE and 0-1 km storm relative helicity. At this point, I have convinced myself that something is going to happen, we just need to wait it out. “Are you expecting storms today?” she questions. It was a bit surreal to have a resident of Oklahoma ask me what to do during a tornado warning or how to mitigate the danger. 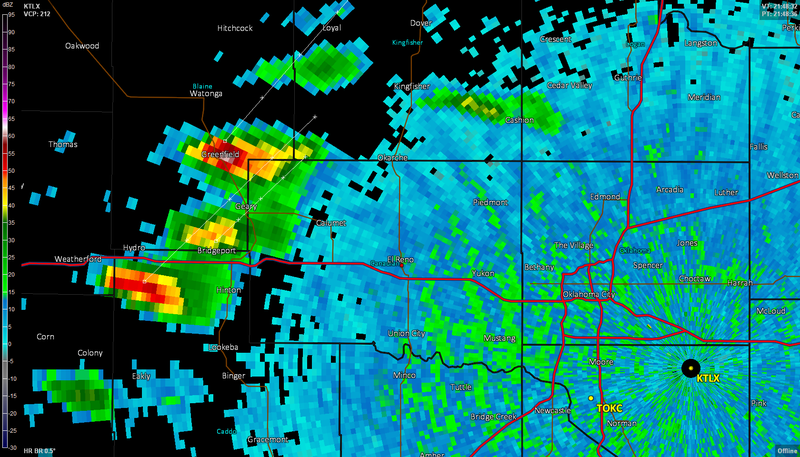 Just before 4:30pm echo tops start to show up on radar 30 miles west of El Reno and within the next four scans the storms are topping out at over 50,000 feet. We expected explosive development, but that was pretty quick. In 16 minutes, a storm went from nothing to 50,000 feet. It is time to say our goodbyes to the fellow chasers who had gathered in the lot. Now it is ‘game time’ and all that matters is the storm. We hop in our cars and proceed through El Reno back to highway 81 and drive seven miles north of town where we find a dirt road just off the highway to sit and watch. In the distance we can make out the rain free bases of three storms in close proximity to each other. The positive cloud to ground lightning is extremely close and very quick as the anvils blow overhead. The resulting thunder sounds more like a gun shot or explosion than usual. The prevalence of the strikes is enough for me to take cover in my car. We sit here for about 25 minutes watching the individual cells congeal into a mess. Concern enters our minds that everything might grow upscale quickly. However, the southernmost cell appears to have clear air to its south so we blast back down 81 to get on the tail end cell. Just as we enter El Reno, the tornado warning is issued for the cell we are heading towards. We detour around the east side to avoid driving through town and catch 81 to take it south of Interstate 40 about 3 miles to 15th Street. We turn west for two miles until we find a nice pull off area next to a field that permits us a great view of the storm ahead. 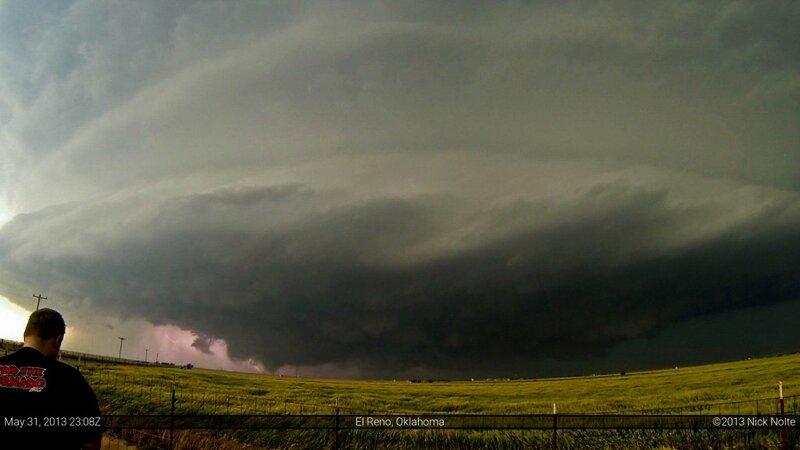 When we get out of our cars we are amazed by the power of the inflow into the storm. It is easily 50 to 60 mph as the wind whistles through the power lines and the wheat waves without abandon as the breeze powers through the fields. As we watch the cell edge closer and closer, the rain below the base hides the developing wall cloud from our view. Later, I was able to pull a few grabs from my video during lightning strikes that showed what we were missing. 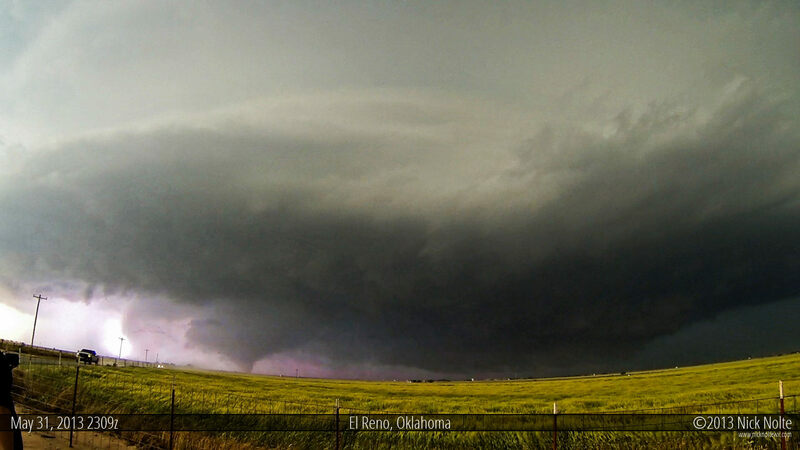 It’s now 6:03pm and the El Reno tornado is getting underway as the first of many tendrils plunge into dirt. Seven miles away, the heavy rain obscures our view of the initial development. Looking at radar, however, makes it abundantly clear that this storm is ramping up quickly and something is likely going on in the darkness. Hook starting to develop with couplet showing on SRV. Note the very strong storm relative inflow east of the hook. Every minute or two, a lightning flash illuminates just enough for us to see there is a tornado in progress beneath the storm. Still six miles away, the inflow jostles us around, throwing our balance for brief periods and we have to steady ourselves. Jenn snaps photos, I shoot video, Skip stands and observes. We take note that the lowering below the storm is drifting towards the left relative to objects on the horizon. The storm has begun to meander south along its path. It is now 6:09 and the tornado is almost heading due east down the road we are sitting on, but it is still 4.5 miles away. 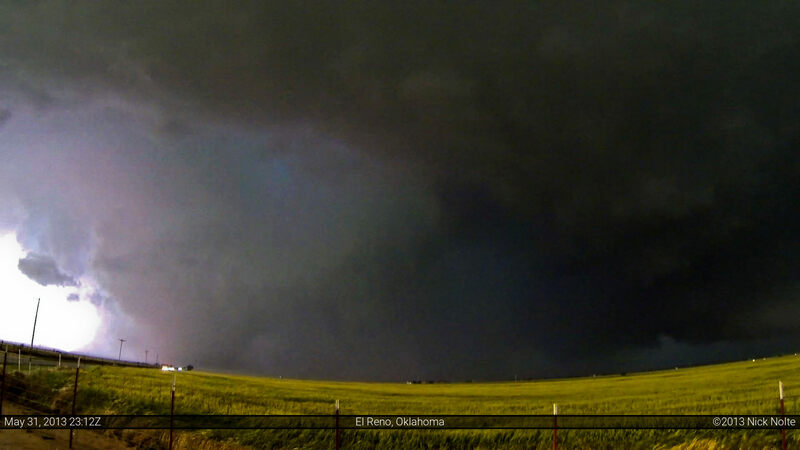 The last three photos are all frame grabs from video when lightning illuminates the tornado. It’s still difficult for us to see anything at all, the storm has drifted further south than we were expecting and the urgency of the situation does not dawn on us for a few more minutes. It’s now 6:10 and the tornado is just under four miles to our west. The tornado has been drifting southeast at around 20 miles per hour. Now, it has turned to the left and starts a more easterly track as it widens and picks up forward speed. It is now 1.3 miles wide and moving east at over 30 miles per hour. The next few lightning illuminated frames show the tornado approaching our position at 15 St SW and Country Club Rd. 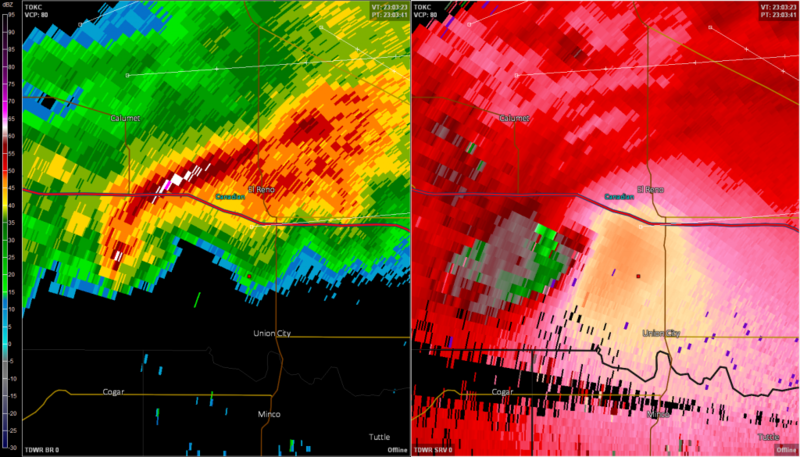 Radar clearly reveals the tornado is increasing in intensity. The red dot just east of the hook is our position at the time of the radar grab (6:12:27). 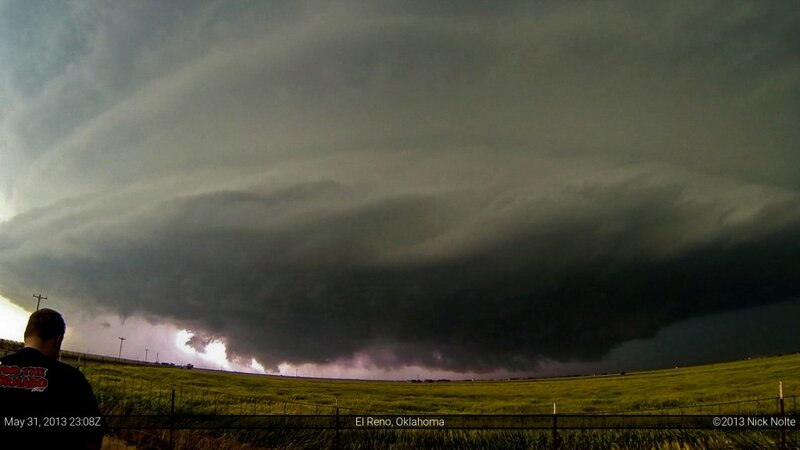 The very strong inflow is also visible on this grab. 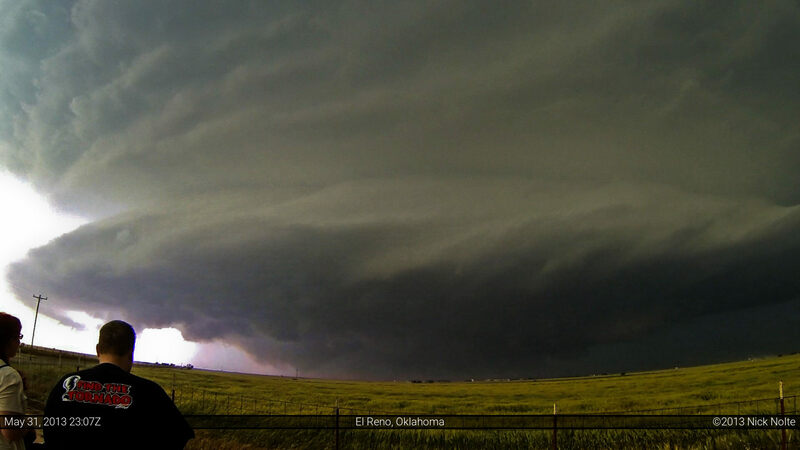 Shot at 6:12:55, this was the last frame my GoPro shot before we bailed east. The tornado is entering its wedge stage. It’s now 6:13 and the three of us still have a difficult time picking the tornado out of the rain. We notice the RFD core is heading straight for us, but we are unaware the tornado is within. It appeared as a wall of rain being forced east by the RFD, but as it encroaches, we can tell it is actually rotating rain bands on the outer circulation of the tornado. The edge of the beast is within 1.5 miles of us and we realize, almost too late, that it is time to get the hell out of here. “We gotta go!” Jenn runs back to the van, Skip closes the dome and I jump back in my car and we start bailing east on 15th Street. I glance in my rear view mirror to see what is happening behind me, but it’s impossible to make out anything. The wind starts to pick up and we just keep driving. This is the moment where I start to feel like I did on May 10, 2010. 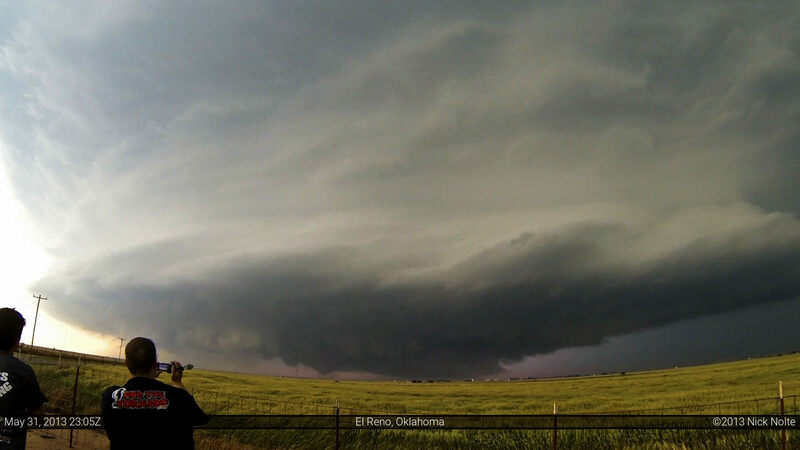 RaXPol, a rapid scanning mobile radar managed by the University of Oklahoma, is scanning the storm nearby. Just as we are bailing east, they are recording wind speeds approaching 300 miles per hour a short distance above the ground. 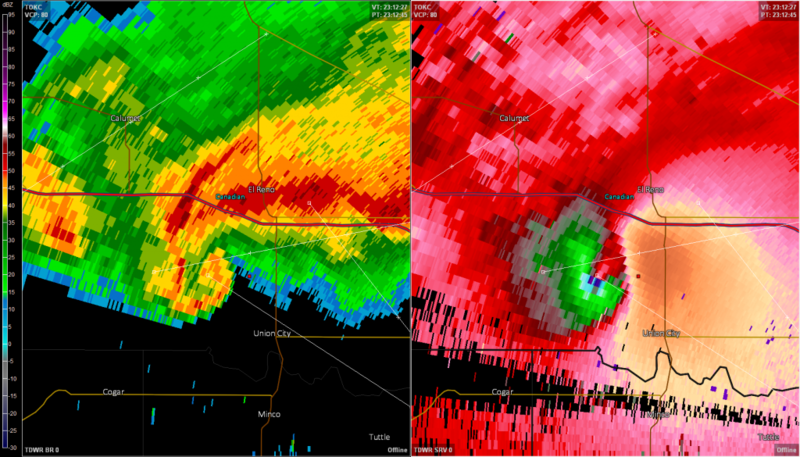 Their radar also shows a very strong tornado with an embedded vortex on the northeast side. 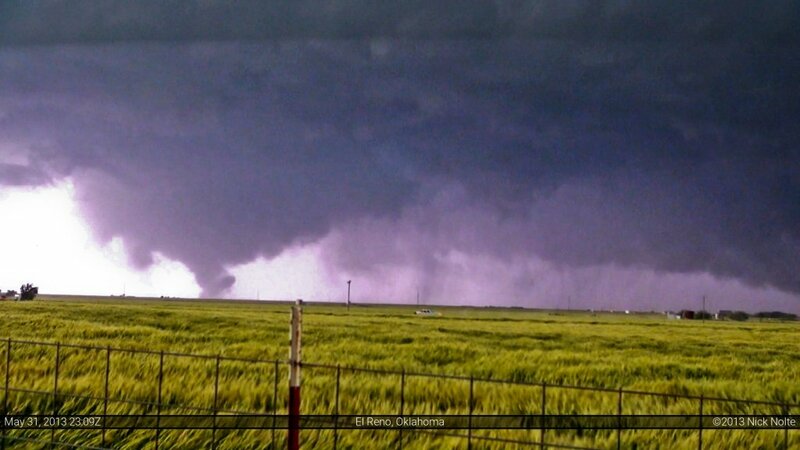 The ground circulation of the tornado is much larger than the condensation funnel. 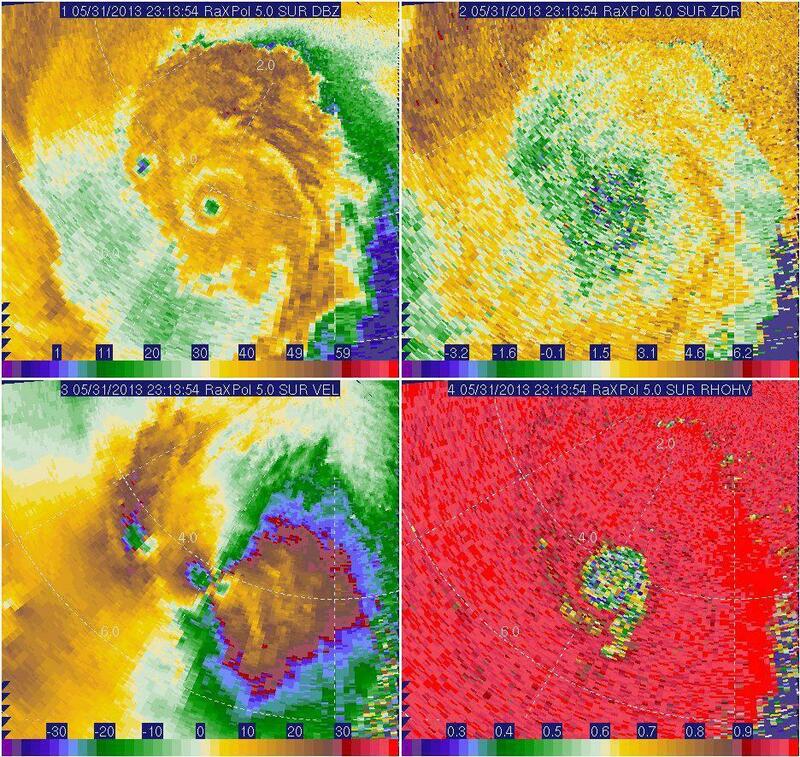 The RaXPol scans show a very strong primary circulation and embedded subvortex in base reflectivity in the upper right panel. 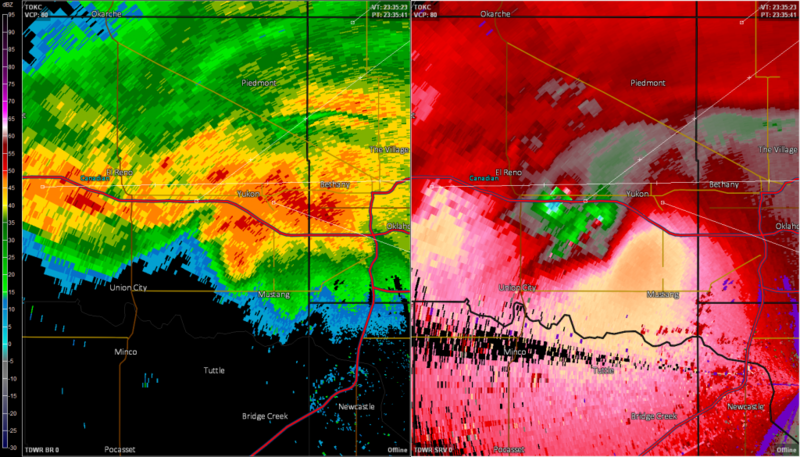 The lower left panel is storm relative velocity. The upper right is differential reflectivity and the lower right is correlation coefficient. At 6:15, we cross Choctaw Avenue. 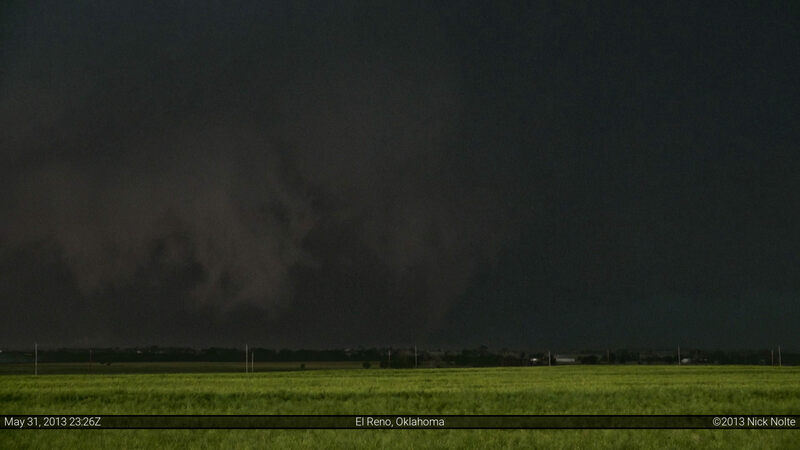 The tornado is now 1.75 miles wide and the edge is within a mile of us. 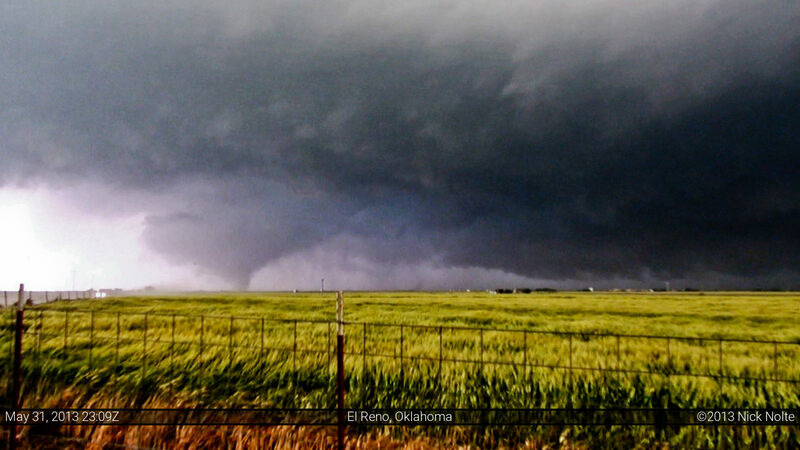 The tornado is now moving nearly 50 miles per hour as it begins to grow in size. This sudden increase in forward speed and expansion in size surprises many storm chasers as they attempt to enact their escape plans. 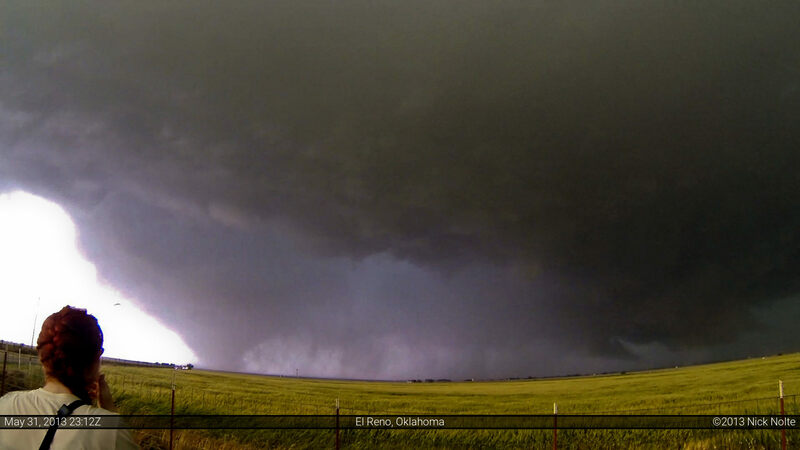 Shot from Skip’s dome camera near Choctaw Avenue as the wedge tornado barrels down the road we’re on. The headlights are my car. Right now, we’re just doing whatever we can to keep going east as fast as we can. We approach highway 81. Traffic to the south is a concern for us, so we decide to continue east unaware of the tornado’s increase in speed. It’s now 6:16, and we’ve crossed US 81, continuing east on 15th Street. The tornado appears to be drifting back to the north a little, so we continue on the eastward path to get distance. At 6:18pm we are about 1.5 miles east of US 81. The tornado has grown to 2.1 miles in width and is still barreling east at 50 mph. Within the next few seconds, it begins its fateful turn to the northeast. At 6:19, the tornado is nearly 2.5 miles wide as it crosses US 81 and begins to turn left. The outer edge of the circulation is about a mile west of us so we keep driving. We can still see rotating rain bands back to our five-o-clock, still south of the road we are traveling on. At 6:23, we finally stop a little over five miles east of US 81 as the tornado is now traveling northeast and we’ve put enough distance between it and us. The tornado is now at it’s maximum girth, 2.6 miles across. We stop to get out and watch. The wind has completely subsided, almost calm. We hear birds chirping and in the distance we hear a faint roar. If there’s inflow still feeding into the tornado, it’s not coming from where we are. It’s very serene, especially compared to the intense wind just 10 minutes earlier at our previous spot. The tornado is off in the distance, about three miles to our northwest. It is still low contrast, so it’s hard to pick out, but this time we’re not obscured by rain. 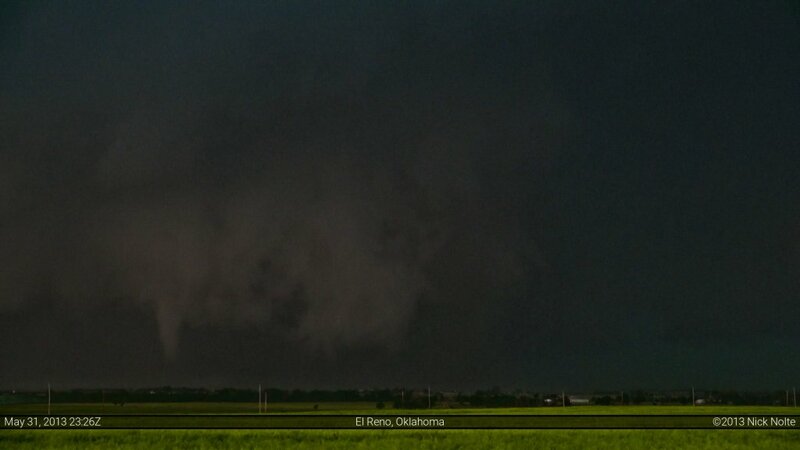 I finally get a visual on the tornado and my jaw hits the ground. This is, without a doubt, the largest tornado I had ever seen. 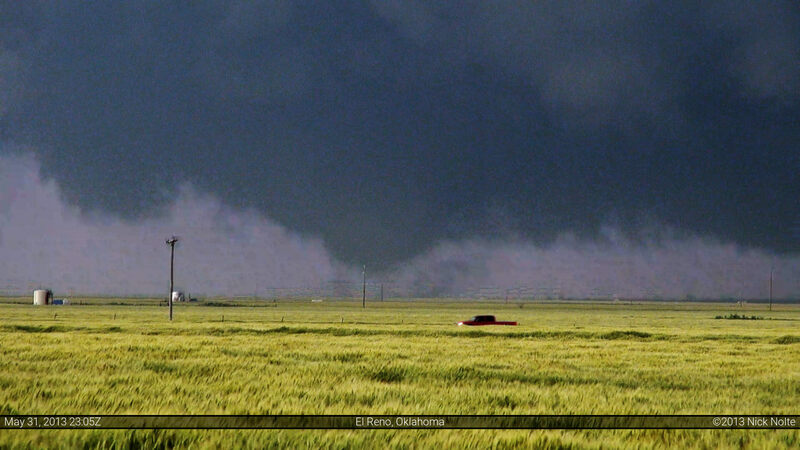 On May 22, 2010, I was within a mile or so of Bowdle, and that was the largest tornado I’d seen up to this point. This one was bigger. It wasn’t even close. It is almost like the entire mesocyclone descended to the ground. We notice little vortices rotating around the outer edge like a carousel. Forward motion of these subvortices were upwards of 150 mph, so not only did you have a huge 2.6 mile wide tornado, but on the outer edges of it you had regular size tornadoes moving around it at 150 mph! While focused on this, Skip notices an anticyclonic funnel just above us. It is pretty small and dissipates quickly. 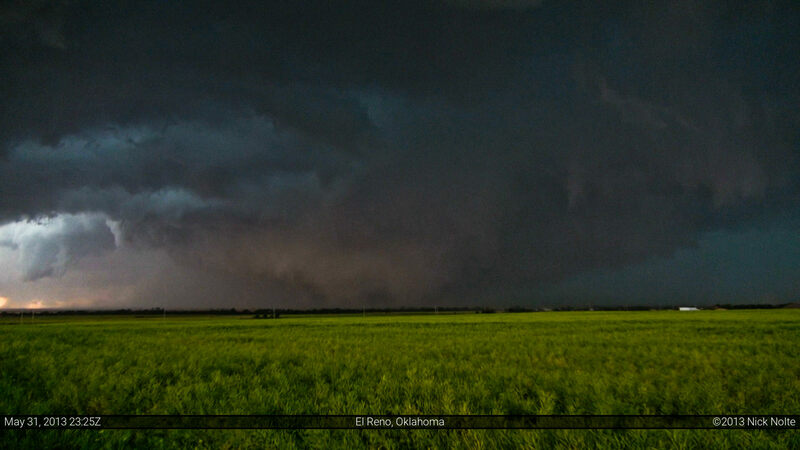 As we stand there watching the El Reno wedge churn away to our north, I pick up the faint sound of a waterfall. We’re three miles away from this thing, surely we can’t be hearing it from here? I asked Jenn if she could hear it, and she nodded. I am dumbfounded. Usually, you have to be within a mile or so to hear one of these things, but here we are, over three miles away, clearly hearing the tornado in the distance. The tornado begins to fade into the rain and at 6:35 we cannot see it anymore, so we head east to keep up with the storm. As we bail east, we notice an anticyclonic tornado spinning up to our left. 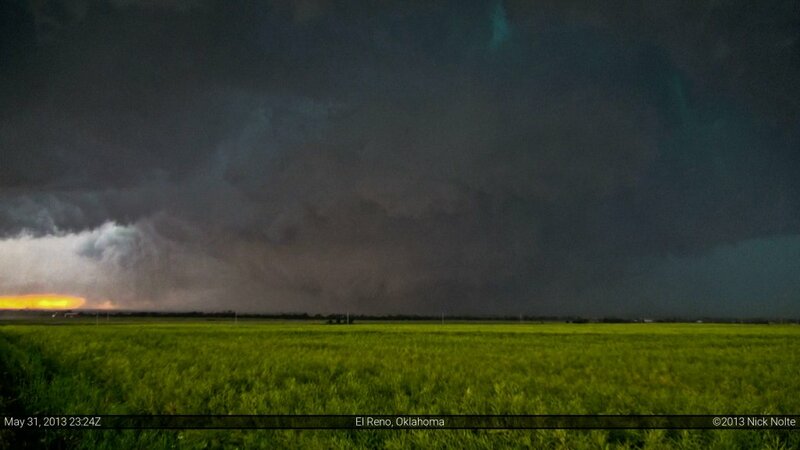 The following is a video recount of the events of the storm up to this point, it includes our first stop where we had difficulty seeing the tornado as well as the second stop when we witnessed the tornado at it’s most intense and widest point. As we continue east, the storms start to push east-southeast so we stairstep towards Mustang trying to stay ahead of the torrential rains. This proves to be a futile exercise as traffic is incredibly thick. At first I am amazed at the amount of chaser traffic present, but later discover that a metro television station had urged people to get in their cars and go south to avoid the storm. Most of this traffic are evacuees from the city! I lose Skip and Jenn in the traffic as we get separated, and when I get to Mustang, I head east to try and keep up with the storm. Skip and Jenn decide to head west to play the westernmost cells in the line. Seven minutes elapse as I attempt to drive one mile south on Mustang Road, a pace of around 9 miles per hour. Traffic is bumper to bumper, whacker chaser lights everywhere, and there is no getting around it. When I finally arrive at SW 89th St, I say “screw this” and head east, but that road is full of traffic, too! When I hit highway 4 it’s clear I am not going to be able to turn left, so I decide to turn right. Even that is proving to be a tricky maneuver given the solid stream of cars heading south. Eventually, a DOW truck pulls around me and forces its way into traffic giving me the opportunity to turn. I head down the highway a half mile to turn around (a Michigan Left) and proceed back to highway 152 to follow the storm. As I close in on Will Rogers Airport, things start getting pretty sketchy. Very heavy rain and strong winds batter my car from the north. I believe this sudden change in wind is due to an embedded RFD blast. Yielding to my better judgement, I turn around and start on a trek back west to play the westernmost cells and attempt to catch back up to Skip and Jenn. Post storm analysis reveals I was, indeed, within the RFD behind the EF-1 tornado that affected the Will Rogers Airport. As I drive west on 152 I encounter a few areas of damage. Power poles snapped, trees uprooted and limbs in the street. Power is out throughout most of Mustang and people still aren’t sure what to do at an inoperable street light. Nevertheless, I continue west until I run into a huge downed tree west of Clear Springs Road which halts my forward progress. Skip had come through here twenty minutes prior and was able to pass unabated. So, between then and now, RFD had probably knocked this tree down across the road. I have to double back to the next south option. My plan is to find the next west road and use that as a detour around the blockage. I start to go west on Southwest 89th Street and shortly into the drive I come across a downed tree. I am able to sneak around it on the left edge of the road to continue on. Then I stumble onto a large SUV stopped in the road unable to go further due to the downed power lines. Power poles along the northern edge of the road have been snapped off and blown into the center of the street. In hindsight, I probably should have turned around, but I decide to drive off the left shoulder to get around them, driving over lines in the process. After I get around the seven or eight snapped poles and their downed lines, I think I’m home free until I crest a hill and see yet another big tree down across the road. “Damnit!” I pull up and notice on the right hand side there is enough room for my little car to squeeze through. I don’t think Skip’s van would have been able to get through there. I get past the tree and arrive at Richland Road where I am able to turn north and, finally, get back west on 152. I arrive in Union City after driving through torrential rains and text Jenn to see where she is. She tells me they are south of the river on the way to Minco. I head south on 81 to try and catch up to them. This would play out in similar fashion for the rest of the night as everyone tries to stay south of the advancing complex of storms. One more wall cloud passes by me in Minco and I attempt to head south on 81 south of town, but the traffic jam rears it’s ugly head again. Instead of plodding along at 10 miles per hour, I turn around and hit the dirt roads a mile east of 81 which are completely devoid of traffic! I never did catch up to Skip and Jenn again that day, and they had decided to hang south to avoid driving through Oklahoma City due to the potential flooding as storms continued to train across the metro area. I didn’t want to have a super long drive home the following day so I decided to begin my drive towards Tulsa. I let Skip and Jenn know I was starting the trek home and took 39 out of Chickasha to I-35 to head back home. Most of the drive was spent in heavy rain, which meant slow traffic as people were stopping under overpasses and parts of the highway were flooded. I started getting text messages from a couple of people who were asking if I was “OK” I thought that was strange, since that doesn’t happen often. I was unaware of what had transpired earlier in the day. Once storm initiation happened, I stopped checking social media. Usually I’ll post an update during the chase, but I didn’t do that today since things were pretty hairy from the get go. I hopped on Facebook to let everyone know I was OK and headed home. I continued the drive to Tulsa and eventually checked into a hotel shortly after midnight. It was later that night I found out about several chasers getting hit during the tornado, including the Weather Channel having their truck rolled a couple hundred yards. Wow! I hadn’t expected that. I spent the next day doing the uneventful, 1,000 mile trek back home to Michigan. I arrived home shortly after midnight and began checking into social media to see what had happened during the previous day’s storm. 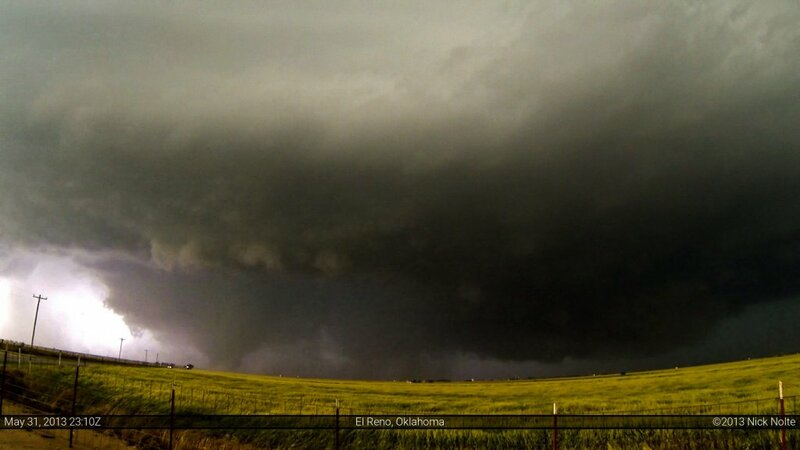 That’s when the news started to trickle in that three members of the Twistex Team had been killed during the tornado. The news of this hit me pretty hard. It was shocking. I’m not going to claim I was friends with any of them. I only met Tim a couple of times and I hadn’t met Carl or Paul until May 19th in Okmulgee, OK when we ran into them at a Mexican restaurant after a chase. Tim was very gracious to talk to us about the chase that night and was always a very down to earth guy the few times we interacted. These three guys chased for research, not just for the thrill and beauty of it. Three of the most seasoned storm chasers in the business, gone. Just like that. If anyone — especially storm chasers — take a lesson away from this tragic event, it is to respect the storm. If people like Tim, Carl and Paul can be taken by a storm, any single one of us can and that is an important thing to take to heart. We’re not invincible out there. If there is a silver lining to be had in this tragedy, they were able to deploy probes in the path of the storm. I’m sure we’ll see the data in the months and years to come. Even in their final moments they endeavored to get the data and further the cause. The three of you will truly be missed, but never forgotten.